Your customer’s card can be declined for several reasons. Often, these issues can be resolved, and the payment recovered. However, many merchants fail to see the importance in recovering these payments, and are unaware of the substantial impact a failed transaction can have on their revenue. Card declines are categorized as hard or soft. Hard declines refer to lost or stolen cards, for example, while soft declines refer to instances such as a maxed out card. These declines especially impact businesses whose revenue is secured in recurring payments from customers. 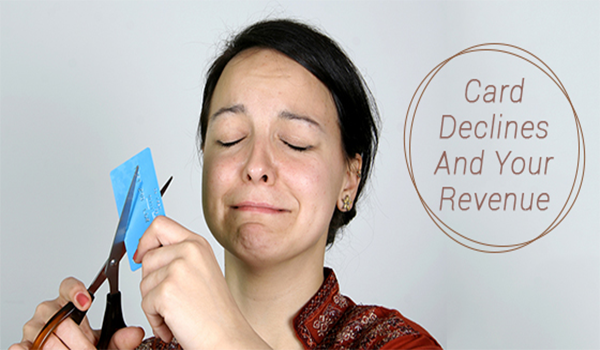 A card decline not only signals a loss of revenue, but also a potential loss of a customer. What might appear as a small problem of a card decline could significantly impact your bottom line. Often, companies can lose millions as a result of card declines. When a customer is declined, they might simply not follow up with the purchase as opposed to contacting their bank or using a different payment method. Fortunately, there are ways to prevent card declines and secure your revenue. A hard decline will likely be more difficult to recover than a soft decline, and understanding the difference can help you to prevent and resolve these issues. A hard decline will require outside assistance from the issuing bank, while a soft decline will likely be recovered after a second attempt, usually after some time has passed. Cards are often declined due to expiry, authorization failures or processing errors. Your merchant provider should be able to prevent and assist with card declines. It’s important to find a merchant provider who can offer you a payment gateway with fraud prevention and administrative tools, secure account verification, and is PCI compliant and accepts all major credit cards. Your payment gateway should include error codes to provide further insight into the types of declines that are most frequent so you can better tackle them. As well, most credit card companies can offer the tools you’ll need to help prevent this problem. Lastly, EMV credit cards should be updated to avoid declines. Keeping the above tips in mind and speaking with your merchant account provider can help to eliminate the lost revenue from card declines and help your business secure both customers and profits. MerchACT has the capability and experience in preventing and resolving declines, and has strong and stable relationships with issuing banks – we can protect your potential revenue from being lost.